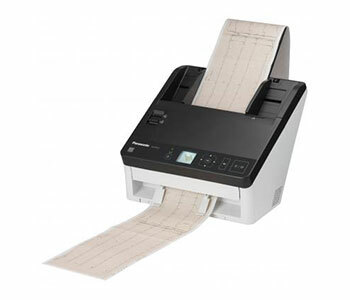 The Panasonic KV-S1057C-MKII can handle almost any type of document from thin paper, to long documents like EKGs, embossed ID cards, and even passports. The Panasonic KV-S1057C-MKII can even be configured to scan directly to email, shared network folder, FTP, or client PC from the control panel when taking advantage of the built-in Gigabit Ethernet port. Designed for high performance and minimal maintenance, the KV-S1057C-MKII enables you to get more done in less time, at an outstanding value. 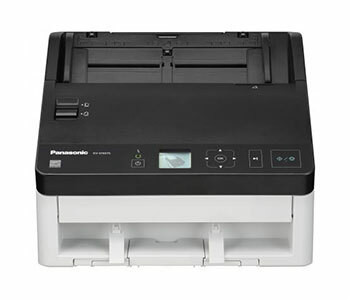 The Panasonic KV-S1057C-MKII scanner has built-in Ethernet, you can easily share this scanner with other people. This can save office space and reduce operational costs. With the KV-S1057C-MKII you can scan all kinds of documents faster, easier and more reliably with the new KV-S1057C-MKII scanner. 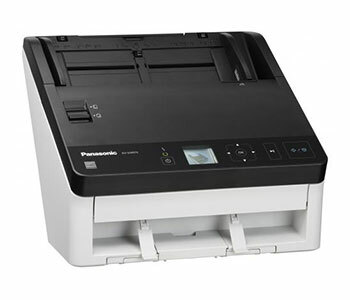 Engineered to enhance your document imaging workflow and information management system with your choice of USB or Gigabit Ethernet connection, robust paper feed mechanism, and advanced hardware image processing technology for the best scanned images possible. With the Panasonic KV-S1057C-MKII quick scanning operation is possible by preconfiguring scan jobs that are accessible from the control panel. This makes routine scanning operation fast and simple. Document Size (Width) 1.9" x 2.1"
Document Size (Length) 8.5" x Unlimited"
Product Dimensions 11.8" x 10.1" x 9.37"